A recital by Giuliano Carmignola (violin) and Kristian Bezuidenhout (fortepiano). Bach: Sonatas: No 2 in A, BWV1015; No 3 in E, BWV1016. Mozart: Violin Sonata in A, K526. 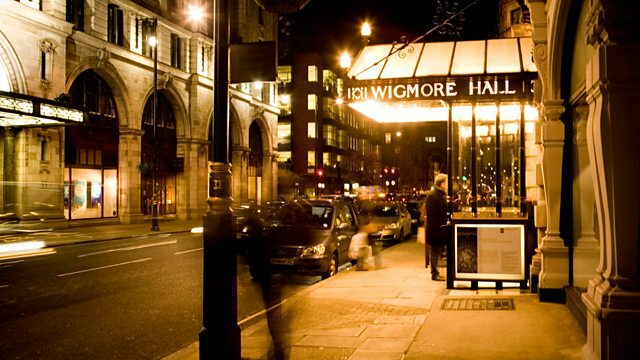 Italian violinist Giuliano Carmignola and South African fortepianist Kristian Bezuidenhout perform the sonatas in A major and E major by Bach, and the Sonata in A by Mozart, K526, at Wigmore Hall, London. Italian period violinist Giuliano Carmignola is widely admired for his performances and recordings of Baroque concertos; South African fortepianist Kristian Bezuidenhout is currently gaining critical plaudits for his ongoing Mozart piano sonata cycle. Here they join up in sonatas for violin and keyboard by two of the greatest masters of the 18th century - Bach and Mozart. Performer: Kristian Bezuidenhout. Performer: Giuliano Carmignola. Performer: Giuliano Carmignola (violin), Kristian Bezuidenhout (fortepiano). Performer: Giuliano Carmignola (violin). Performer: Kristian Bezuidenhout (fortepiano).